The baseball scorecard is an essential component of the soccer game as it records the entire changes that happen in the game. It contains many spaces on it to record the runs and hits of both the teams playing the game. To note the bases, diamonds are included in the scorecard. You can also see Balanced Scorecard Templates. The names of the catchers, umpires and pitchers are also mentioned in the scorecard.This scorecard is an important part of the game to record the score of the game. For its proper application, it can be used in the formats of Word, Excel and PDF. You can also see Scoreboard Templates. It measures whether all players of a team is present for each day. The team manager of base ball will need to analyze the presence of players each day through attendance. When they need to achieve this, they no need to prepare own attendance and they can opt for pre defined base ball score sheet. It is the main part of game to measure the performance of teams during basket ball competition. It will be helpful to store information about players. It will be stored in an excel document to fulfill the needs and requirements of players. It keeps track information about scorer. The scorer information will be stored separately as each team score and highest and lowest score. 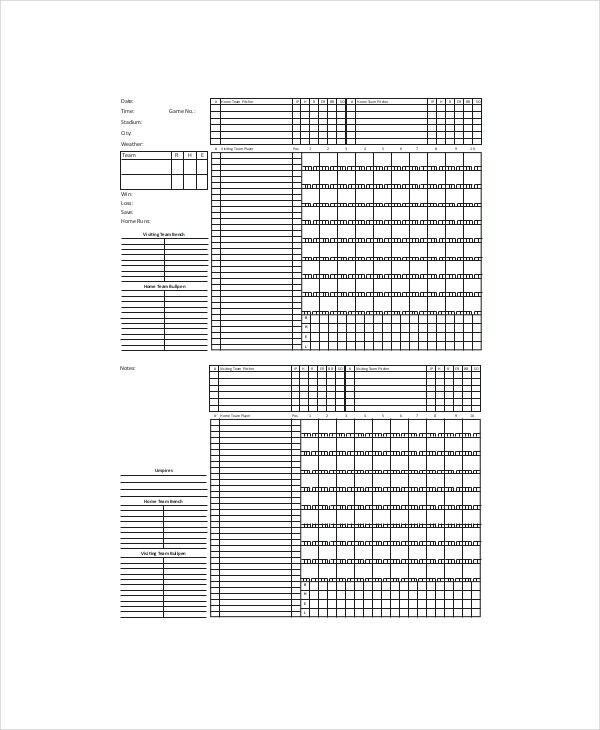 When the scores need to be pointed out for eqach team, the team manager can just download the pre defined blank soft ball score Excel sheet and then can use it. It will also store information about winner and name of winner. 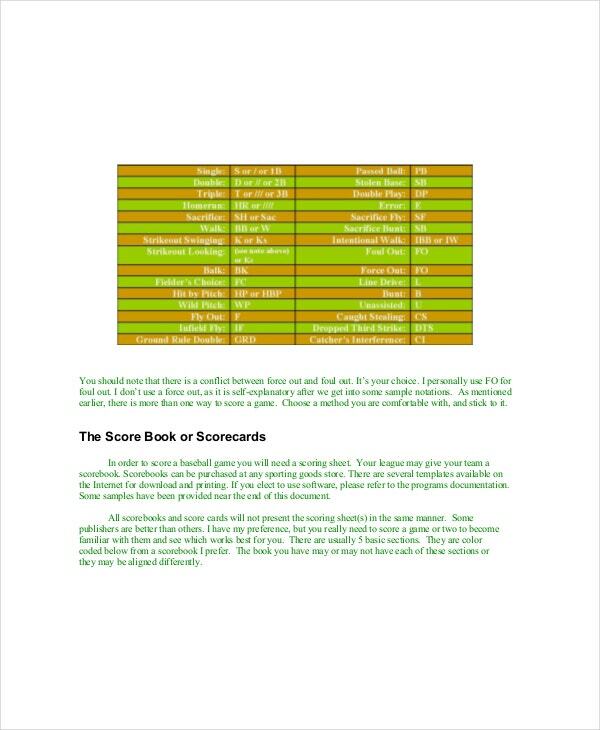 The scorer template is needed to maintain information about winner and difference between scores of each team. This template is mainly needed to measure the starting and ending time of game. It also maintains the information about time of each day at the game starts and ends. The pre defined time will be presnet in excel sheet and team manager can just download and use it. The time taken by each team to get the maximum score is also maintained. It also note down about visitors time. A score card template is available in PDF format which will have tendency to calculate major statistics of the match for you easily. Baseball is a popular game played over the world. Base ball score is highly essential for game to keep track of performance of teams during baseball competition to finalize the winner. You can also see Basketball Scoreboard Templates. 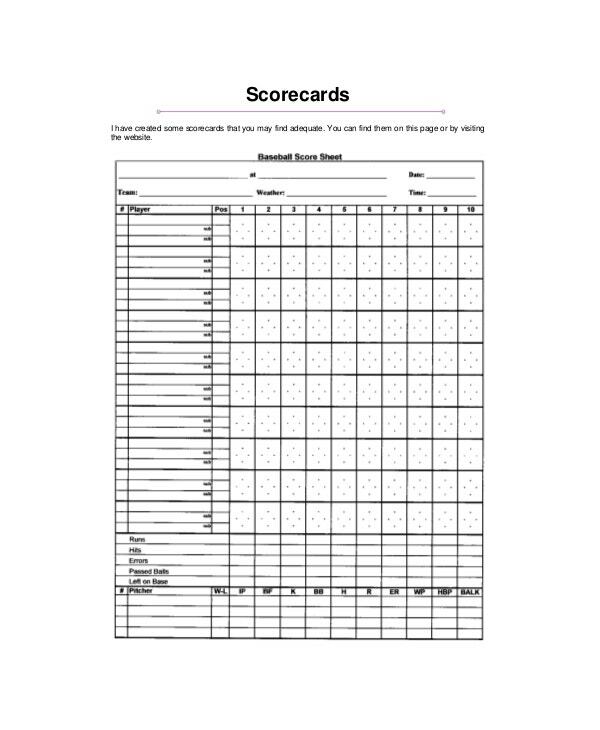 Whether you are playing baseball locally or national level, you can just use this score card template in order to simplify the task. This template is an Excel document which will suit various needs and requirements. 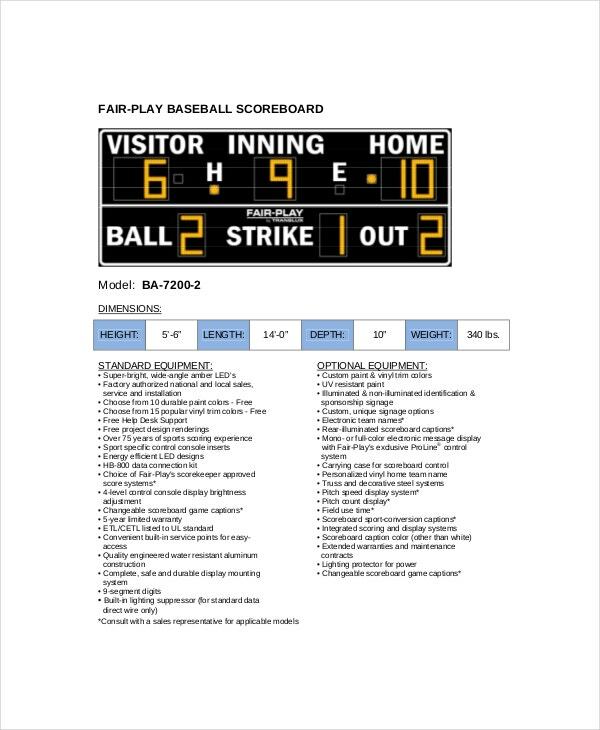 It is not only a layout to make base ball score card but also it will provide set of instruction to make it easily. The main reason behind introduction of this template is to keep score of base ball of all over teams involved. Apart from score information, it will also store information about players of each team and their attendance details. It will tell some techniques to win in the game easily. It keeps track about the information of players and their winning progress. It is the main thing to decide the final winner. Therefore, it is compulsorily needed to store the information about base ball entities such as winners, players, scores, winning strategies, visitors and time. The main goal of keeping this is to simplify the information maintenance. 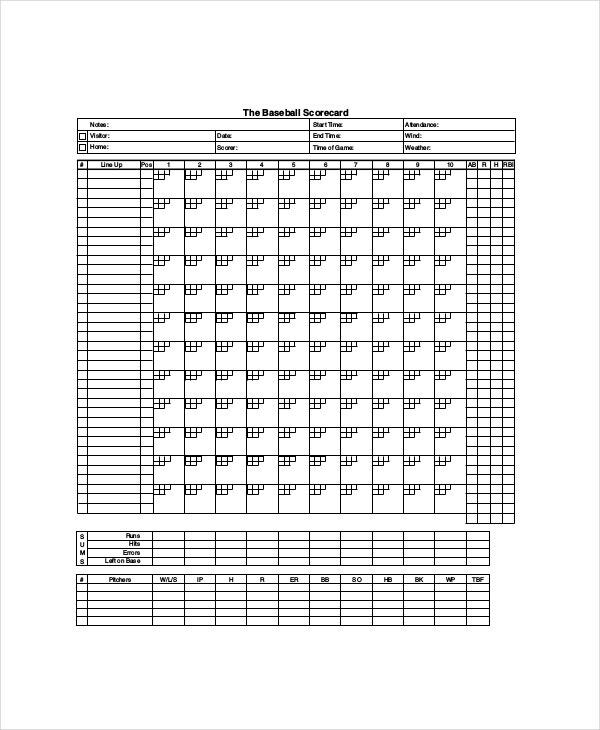 If you are the arranger of base ball tournament, then you are indeed of clean good looking base ball score sheet. 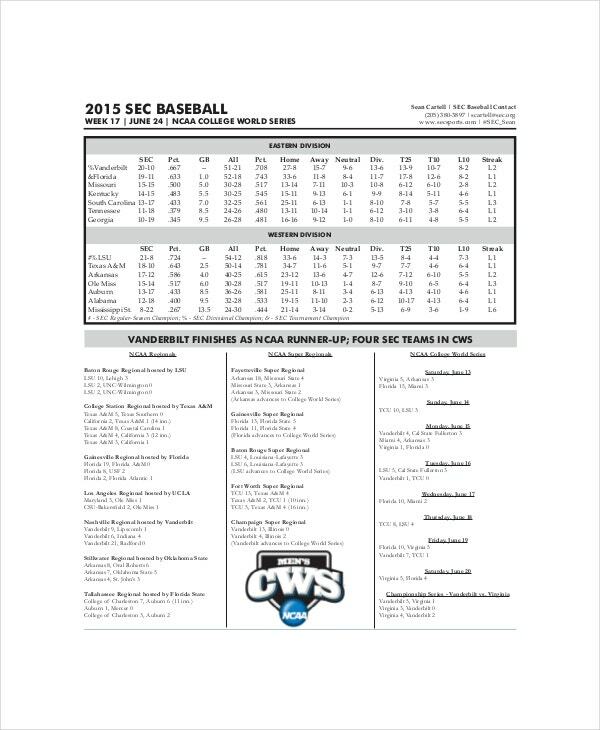 You can simply download base ball score sheet template. 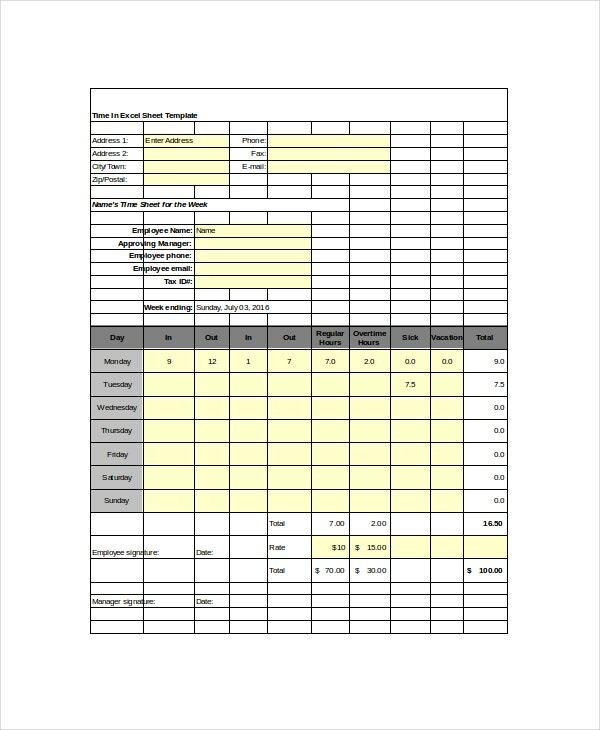 You can use it as your own sheet template. 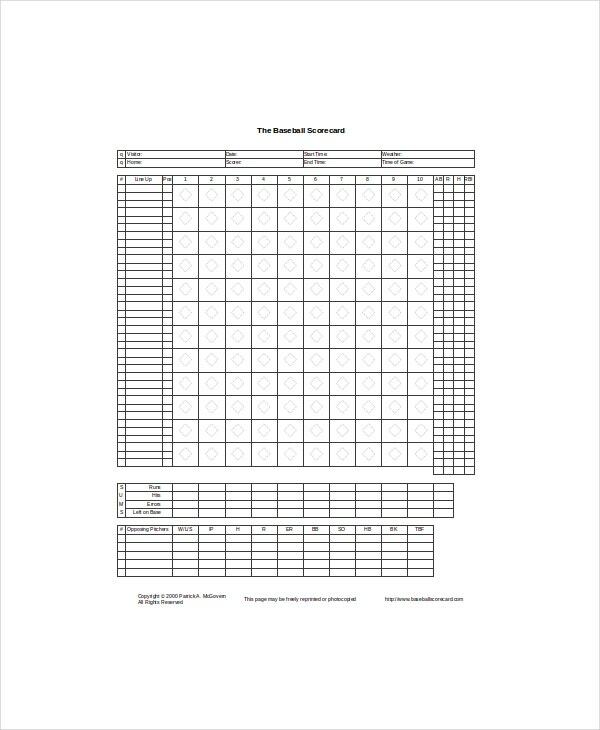 With the help of base ball score sheet template, you will finish your work within few minutes. You can use that record to store information about runs and other information about teams. This template will be the best companion for you when you are in need of maintaining the base basll score template without getting help from other person. When you download this sheet, you are away from the work of creating a new sheet. You can also see Football Scoreboard Templates. It is finalized to be the main thing to store the information of scorers, winners and also about the players. It will store from the basic information to compulsory information. It will store information about players and total number of teams. It is the record to keep track of top score and least score. 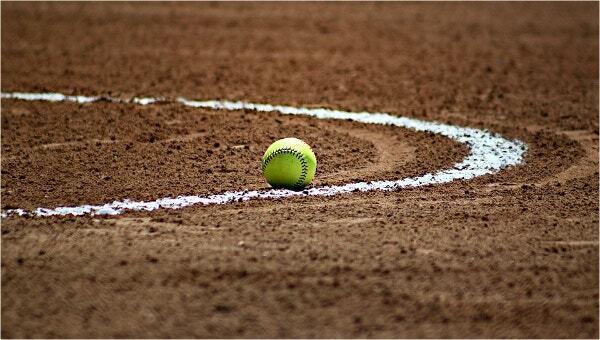 It will also store some strategies to win in the base ball quickly. When it stores the information about all things, it will be helpful for an organizer to see the information or to analyze the information when it is needed. It will be finally considered to decide about the winner of the base ball game.